Learn how to develop an ecommerce strategy that fits the needs of your company. 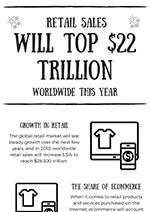 The retail industry grows fast. With the explosive growth of e-commerce, here’s how you - a retailer, can adapt to the changes and keep growing. Learn how to develop an ecommerce strategy that fits the needs of your company. Generate more revenue by acquiring new customers and retaining old ones. We're committed to your privacy. PIMworks uses this information to contact you about our relevant content, products, and services.